Our peripatetic Backstage Baker has returned to the city! After enjoying a few days of downtime after “The Master Builder” closed at the Brooklyn Academy of Music, James then drove eight hours north to stage manage “The Romeo and Juliet Project” for the Chautauqua Theater Company. (I hear it had a cast of 90 and used over 14 rehearsal spaces!) Now, he’s back in town and already in pre-production for his next Broadway show, “A Time to Kill“. It starts previews on September 28, so fingers crossed that James will have time for some rehearsal baking . . .
It’s a heavy, emotional project. What better time for a “Write, Wine and Unwind” gathering? 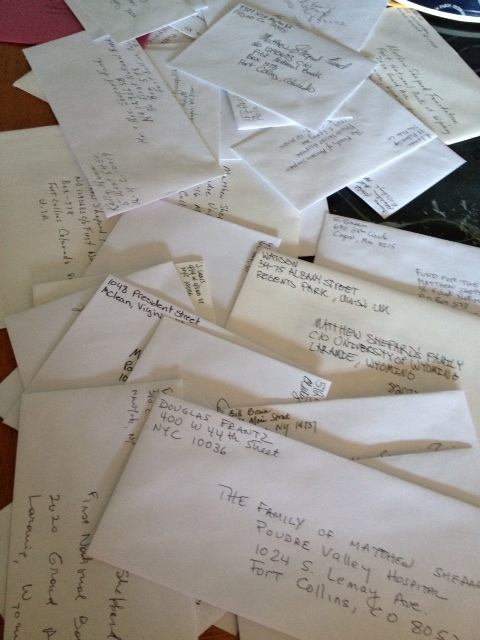 And folks dropped by all afternoon to enjoy the brownies and address envelopes to the Family of Matthew Shepard. 1. Heat the oven to 350°F. Grease a square baking pan with butter or line it by overlapping 2 pieces of parchment paper or aluminum foil crosswise and grease the lining. 2. Combine the stick of butter and the chocolate in a large microwave-safe bowl and microwave them on medium for 10-second intervals, stirring after each interval. When the chocolate is just about melted, remove the bowl from the microwave and continue to stir until the mixture is smooth. 4. Pour and scrape the mixture into the prepared pan and bake for 20 to 25 minutes, until just barely set in the middle. Cool on a rack until set. If you used parchment, lift it out to remove the brownies. If not, cut them in squares right in the pan. 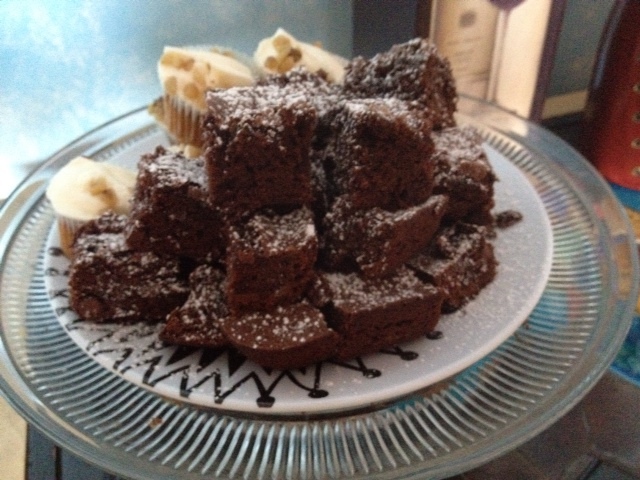 I then dusted the cooled brownies with powdered sugar. Store, covered, at room temperature, for no more than a day.